WE WON AWARDS AT OUR FIRST INTERNATIONAL COMPETITION!!! 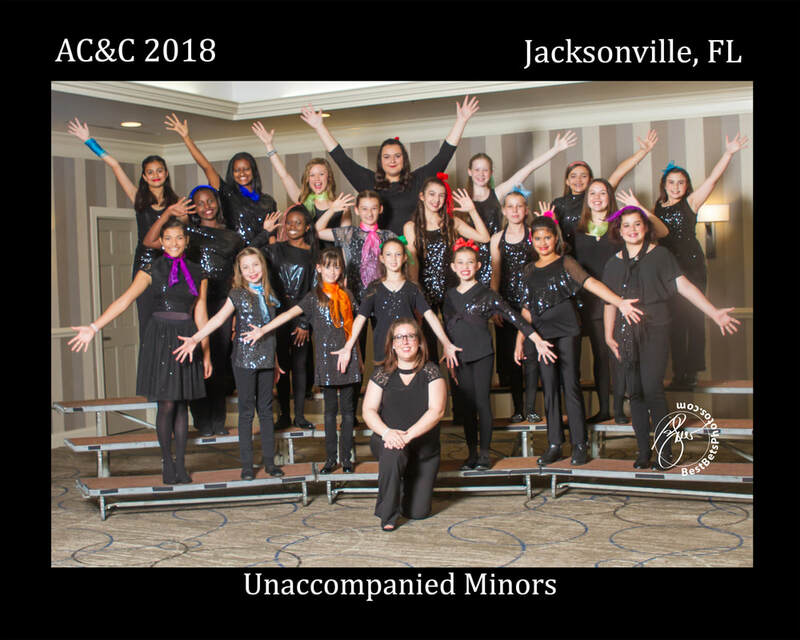 Unaccompanied Minors competed in our first International Convention and Contests! In the International Competition in Orlando, FL, October 31-November 4, we came in 14th and won two awards! It was an amazing experience and we're looking forward to our next Area Contest in Jacksonville in April. We are a competing a cappella chorus that participates in conventions and contests each year. The purpose of these conventions is to educate members in the performance of the craft, bring together choruses and quartets to see the best perform and encourage an atmosphere of friendship and camaraderie. Youth from Central Florida are invited to join Unaccompanied Minors and, after an audition process (online submission), will receive two barbershop songs to learn on their own. We will have monthly rehearsals on Saturdays to balance, clean and develop interpretation of our music. ​Each person selected to join Unaccompanied Minors will pay an annual fee of $60. This fee will cover membership in Harmony, Incorporated, sheet music and learning tracks for the year, through February 2020. Barbershop: A Cappella's Martial Art. “You're young, you're scrappy. You want to be the best. You started singing in school, like everyone: choir, maybe a couple musicals. Karaoke with some friends, talent shows. Then some collegiate a cappella. But you don't want to just be fine. That's not enough. You want to be great. You want technique, you want moves. You need to learn karate... except contemporary a cappella doesn't have a traditional refined martial art...does it? COMMUNITY: When you sing Barbershop, you're always only 3 guys away from a song, because there's a common repertoire and a perpetual desire to sing. Everyone's on the same team playing the same game, and you always win. ​If you would like more information, please send us an email!